Distribution and habitat: Euphorbia pseudocactus is originating in subtropical coast of South Africa. It is growing in thorny bush-lands and savannah often forming colonies. Description: Euphorbia pseudocactus is a thorny succulent, clump-forming shrub that grows to 1.5m (5 feet) tall indoors. 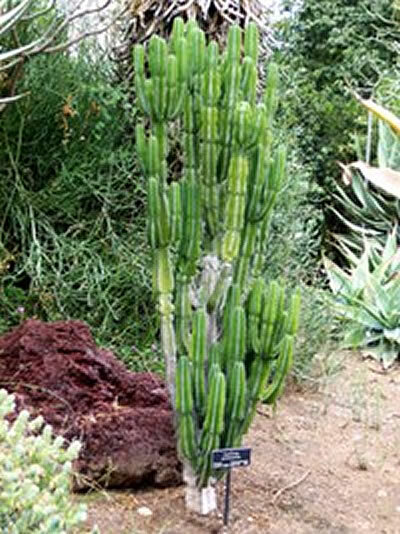 It is closely resembling a true cactus, with several upright leaf-less stems, which are four or five sided. These stems have yellowish fan-shaped markings on a bright green or grayish green background; they are 4-5cm (1.5-2 inch) thick, but nipped in at 10cm (4 inch) intervals all along their length and have 1-2cm (0.4-0.8 inch) long spines. Houseplant care: When handling the Euphorbia pseudocactus should be used caution because of the sharp thorns of this plant. Also the sap can be irritable for sensitive skin. It is easy to grow these beautiful and rare tropical succulents. They generally require no more attention than the average houseplant. Light: Euphorbia pseudocactus need full sunlight all year long. Temperature: Normal room temperatures are suitable during the active growth period (spring, summer and early autumn), but these plants do best if given a winter rest period at 12°C (54°F) or fewer degree lower. Water: During the active growth period water sparingly, only as much as necessary to make the entire potting mixture barely moist, but allow the top two-thirds to dry out between waterings. In mid-autumn gradually reduce the amount of water given. During the winter rest period water the plants only enough to keep the potting mixture from drying out. Fertilising: Apply a week solution of liquid fertiliser once or twice during the active growth period. Potting and repotting: Use an equal-parts combination of soil-based potting mixture and coarse sand and perlite. Provide extra drainage by putting plenty of clay-pot fragments or other drainage material in the bottom of pots. Move plants into pots one size larger every spring; 15-20cm (6-8 inch) pots should be the biggest needed. After that, top-dressing with fresh potting mixture in the spring will be enough. Gardening: Outdoors, Euphorbia pseudocactus is an easy species to grow that is suited for any well drained soil in full sun. It can tolerate moderate shade. A plant that has been growing in shade should be slowly hardened off before placing it in full sun as the plant will be severely scorched if moved too suddenly from shade into sun. It is a moderately fast grower and will become large landscape masterpieces in just 3-5 years. Once established, it will be content in its position and with its soil for years. It will be best to plant Euphorbia pseudocactus in a location where winds are not a big issue as in strong winds, the columns often smash into each other, causing permanent scarring. It can be pruned for shape and branching. It is frost tender, so plant Euphorbia pseudocactus outdoors in frost free zones only. In colder climates simply bring the plant indoors for the winter months and provide proper light and water. Propagation: Take stem cuttings in late spring or early summer. These succulent Euphorbia pseudocactus produce a particularly large amount of milky sap and it is essential to stop the flow of latex at the cut ends quickly by spraying the wound of the parent and dipping the cut end of the cuttings in water. Allow each cutting to dry for several days before planting it in a moistened equal-parts mixture of peat moss and sand. After filling the pot with mixture, sprinkle some coarse sand on the surface in the area where the stem is to be inserted. This will facilitate rooting and help prevent the possibility of stem rot. Leave the container uncovered at normal room temperature in a position where gets sunlight filtered through a translucent blind or curtain and water just enough to keep the mixture barely moist. In favorable conditions rooting should normally take place in about six to eight weeks; one the young plants have begun to make new growth, thus indicating that rooting has occurred, pot them up in the normal mixture and treat them as mature plants. If plant becomes very red, this is a sign that the roots have not developed properly. Treatment: Ensure that plant has a well drained soil with addition half coarse sand or perlite. Euphorbia pseudocactus is prone to mealy bugs and rarely scale. Treatment: Use for mealy bugs an appropriate pesticide. Spray all top growth with pesticide or place granule of a syntetic pestice in the potting mixture. During the next month examine plants weekly for traces of re-infestation. If scales are the pest that infested the plant, wipe them off with a damp cloth or a fair stiff brush dipped in soapy water or an appropriate pesticide solution. Then apply the pesticide to the whole plant. Uses: Euphorbia pseudocactus suits suits mediterranean, contemporary and dry gardens style designs. It is used as barrier, groundcovers, accents or container plant for indoors or outdoors. Plant Euphorbia pseudocactus into the rock garden or foundation planting bed in water-conservation gardens in frost-free regions. Elsewhere enjoy it as a low-maintenance houseplant. In summer Euphorbia pseudocactus can be displayed in gardens or on terraces. Toxicity: Euphorbia pseudocactus contain a white sap that can be irritating to eyes and mucous membranes. If contact is made with this white sap, take care to not touch face or eyes before washing hands with soap and water.